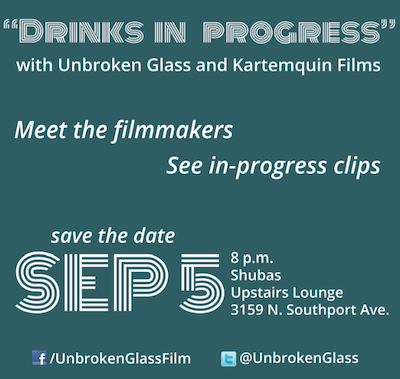 Raise a glass for "Unbroken Glass"
Join the makers of Unbroken Glass on September 5th at Schuba’s for an evening of drinks and music and watch brand new in-progress clips of the film, which will be a future Kartemquin Films release. DJ Zak Piper will be spinning an unmatched selection of classic soul records. Entry includes one drink and a custom “Unbroken" pint glass. All proceeds will support the film. Twenty years after their deaths, filmmaker Dinesh Sabu sets out to learn the truth about his parents' lives. Retracing the story of his parents immigration from India, Dinesh uncovers his mother’s schizophrenia, a mental illness that perhaps ultimately led to her suicide. Rather than retelling a linear history of his parents’ lives, the film paints an impressionistic portrait of them and Dinesh’s journey of discovery. Through memories, personal interviews, and verite scenes, Unbroken Glass shows one family confronting its history of mental illness and loss.